VATICAN CITY (CNS) — Pope Francis asked the world’s young Catholics to perform spiritual and corporal works of mercy every month in the run-up to World Youth Day next July. Jesus and his beatitudes show how it is better to give than to receive and how “we will be truly blessed and happy only when we enter into the divine ‘logic’ of gift and gracious love,” he said in the message, released Sept. 28 at the Vatican. When people discover that “God has loved us infinitely in order to make us capable of loving like him, without measure,” then they themselves can become instruments of God’s mercy, bringing hope and healing to those in need. “I ask you, then, to rediscover the corporal works of mercy: to feed the hungry; give drink to the thirsty; clothe the naked; welcome the stranger; assist the sick; visit the imprisoned and bury the dead,” he said. Pope Francis recalled the example of Blessed Pier Giorgio Frassati, who lived his short life by receiving God in the Eucharist every morning and then returning that divine presence and love by visiting and helping the poor each day. The pope also asked young people to find inspiration in the prayer of St. Faustina Kowalska, which describes specific ways one’s eyes, ears, tongue, hands, feet and heart can be merciful in everyday life. “The Divine Mercy message is a very specific life plan because it involves action. One of the most obvious works of mercy, and perhaps the most difficult to put into practice, is to forgive those who have offended us, who have done us wrong or whom we consider to be enemies,” the pope said. “Only a few months are left before we meet in Poland. 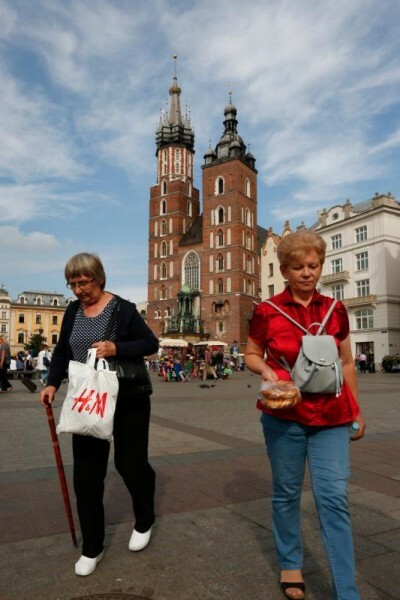 Krakow, the city of St. John Paul II and St. Faustina Kowalska, is waiting for us with open arms and hearts,” said the pope, who was scheduled to attend events July 28-31. These two saints were “two great apostles of mercy in our times,” as they desired the message of God’s mercy reach all people on earth and fill their hearts with hope, he said.